Sun Belt Offensive Player of the Week: Caleb Evans, Louisiana-Monroe -- Threw for 332 yards and two touchdowns and ran for 102 yards and two scores in the Warhawks' 44-25 win over Georgia Southern. Sun Belt Defensive Player of the Week: Derambez Drinkard, Coastal Carolina -- Intercepted two passes, returning one 60 yards for a touchdown, in the Chanticleers' 23-7 loss to Appalachian State. Sun Belt Special Teams Player of the Week: Tyler Sumpter, Troy -- Converted 4-of-4 field goal tries, with a long of 49 yards, in the Trojans' 26-16 win over Louisiana. Sun Belt Coach of the Week: Matt Viator, Louisiana-Monroe -- The Warhawks outgained Georgia Southern 573 yards to 216, and held the Eagles without a rushing touchdown, in a 44-25 win. 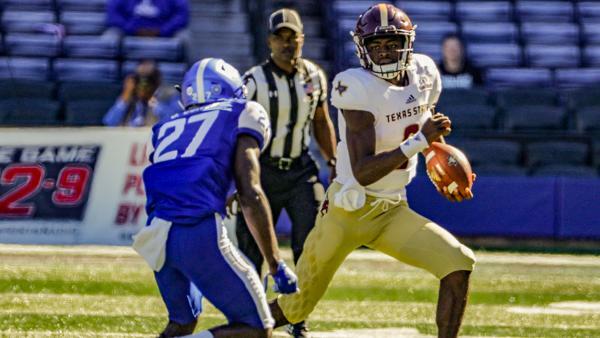 Sun Belt X-Factor of the Week: Willie Jones III, Texas State -- Completed 21-of-26 passes for 325 yards and two touchdowns, adding 62 yards and a rushing score, in the Bobcats' 40-31 win over Georgia State.